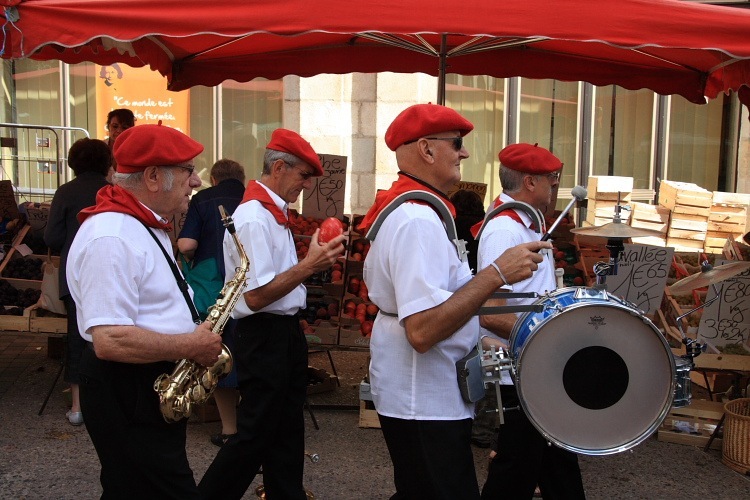 We appear to have lucked out; having arrived on Friday afternoon at Le Puy-en-Velay, we discovered that Saturday is market day. We set off this morning on foot for our first investigation. Our walk was a little further than we anticipated. We were a somewhat further out of town than we thought and the footpath took a rather circuitous route along the banks of a couple of the local rivers, La Loire and La Borne. Nonetheless it was pleasant enough four mile walk and eventually some of Le Puy’s more famous landmarks (more of these tomorrow) began looming large as we neared our objective. Faced with a sizeable town and wanting to find the market, our technique is to spot pedestrians carrying shopping bags loaded with goodies and walk in the direction from which they came. 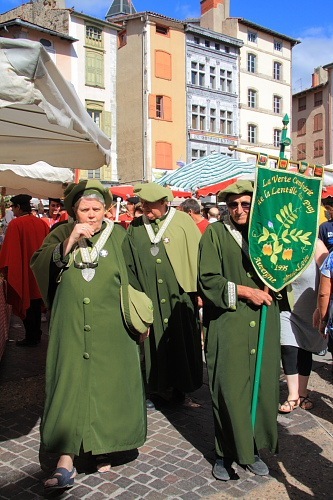 Soon we were close enough to pick up some audio clues – not only was there a market but there was a parade on, too, which seemed to be of producteurs from various parts of the country all dressed in colourful regalia. Since the parade pretty much filled the limited street space within the market, it made market shopping quite difficult but it was most entertaining to see. I’m not certain if it helped the tradesman’s business, though. 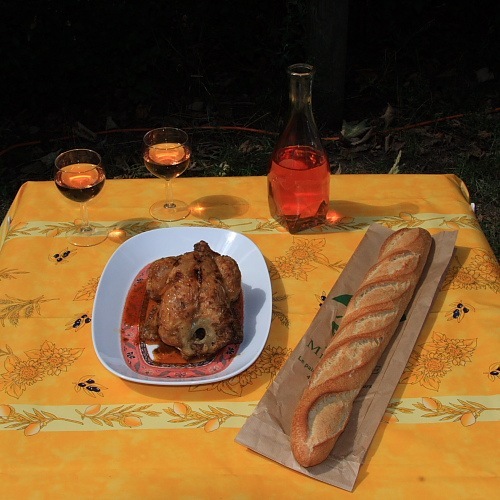 We limited our purchases to a baguette and a poulet rôti (rotisseried chicken – most French markets have excellent rotisseries) which got popped into a greaseproof bag with some tasty juices and hit the four mile return path for one of the messiest but most enjoyable lunches. This is one of our favourites; there’s something inherently enjoyable about tearing roasted meat apart with your hands and slapping it in some good bread. We’re here tomorrow to see the town minus the market but moving off on Monday so we needed more supplies. Since there is a McDonalds next to one of the supermarkets, we braved the Le Puy traffic jams and went to the other side of town in search of McWiFi as well. Rush hour was well under way as we returned, though it was still less severe than at home. Evening proved to be a little too windy for comfortable dining en plein air so we reluctantly dined inside Billy (salade Niçoise) for the first time this trip. 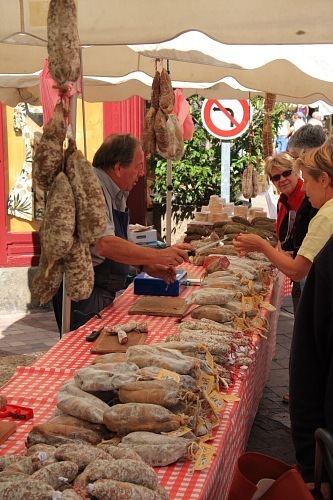 I still have good memories of the market at Dives-sur-Mer even discounting the paupiettes de veau buying process.